« Is PageRank still important in SEO? You are wrong! I had very few visitors just a two months ago! You can start a free blog (I have even written some post about creating blogs some time ago) and if you have interesting topic you can get a huge number of visitors almost instantly! This is how today web is working! Just make sure to write interesting posts and catchy titles and submit it to many popular social media services (Digg, Stumble Upon, HN, Reddit and many more...). If you have something interesting to write - people will want to read it! So if you have traffic you can make money... right? You would be surprised but it is not so obvious. I have been making just a few $ per month with AdSense as you need a really huge amount of visitors to make a good CTR and make money with anything just because you have traffic. It is all about way of promoting this what you have. You need to have a good and interesting product or service. You must be sure about its quality and know that it can be useful to your blog readers. 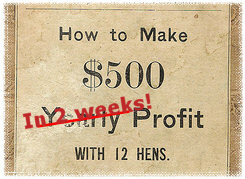 AdSense brings just a few cents per day... and you want $500? You have a blog. You have some readers that like what you are writing. So... you probably have some good knowledge in your blog main topic. If not you should create blog in niche you really know! So if you know a niche really good you probably have been successful with it and you think that you shouldn't share all knowledge to anyone as people would be overusing it and it would lose in value...? Get rid of AdSense and make some real money! Knowledge is one of most valuable things available online! Not only online but anywhere! Isn't it what teachers in school have been telling you? So if you have this special knowledge that you don't want to be accessible to anyone but if you share it with just a few of you best friends (blog readers) and by the way make a few bucks it wouldn't hurt you at all...? So create a report or an ebook! Don't forget to promote it on your sidebar and what is the best way of getting attention - mention it in your blog posts (only if it really can fit the post topic). It worked for me... Why it would not work for you...? I did it and set special price to my blog readers to as low as $9.95 and much higher to strangers $19.95 (my report is still available in special price for my blog readers right here "PageRank 4 in two weeks?" - sorry but it is no longer available). I have sold over 50 copies in two weeks (Thank you again for a great feedback about my report!). It will make me no difference if all of these people would build high PR websites. But if all of few thousands of my blog visitors would do it - it might hurt my SEO method. So it is your turn! Just do it! Stop using pay per click programs! And if you have no blog - create it for free on any blog platform and make some money! But if you think that this method is not good for you - subscribe to my blog to read about more ways of making money online... Any feedback and comments are really desired and appreciated =). You seem to have a very transparent and honest style of writing and it works well! I love to hear people’s success stories whether they’ve made $1 or $1 million, it’s always interesting to know how they’ve done it. Thanks trucious – that is great and very motivating to hear some good opinions as well. I really like your blog and I actually found it by browsing through Pat Flynn’s Smart Passive Income blog. What I’m interested in is learning more about how you got your iStockPhoto passive income up and how long that took. I looked through all your stock photos and I would think that it was probably not that hard to get all the photos up and running. What was the process like, how long, how did you decide what types of pictures to take, did you have to think much about SEO when naming the pics, keyword research, etc.? Thanks for your time and for the cool blog you’re building. Thank you for your comment – you ask a lot of questions. I will try to answer it for you. It took me quite a long time as I do not add it regularly. But I believe that if you want to really focus on istock you may add same number of good photos in really short period (but you still must add quality photos as istock inspectors are very critical). About type of pictures that sell the best for me – just go to my portfolio and sort it by downloads… And about SEO – I do not work on SEO other than for internal search engine. I just use keywords of photos on similar subject that have most downloads.